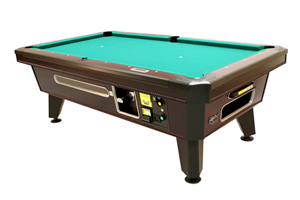 We offer a great selection of pool tables to choose from. To learn more visit the manufacturer websites below. With a striking new silhouette reminiscent of days past and the unique upscale appearance of our mahogany finish with satin black corners and metal trim, this is a whole new cat from Valley. The Top Cat. Time-tested durability can still look attractive. Our new Highland Maple apron laminate pairs with black, white sight top rails, smoothly-integrated corner castings, flush-mount pocket liners and hidden-screw rail trim for a timeless yet updated look. The 5-bolt dual density cushions, Valley Ultra cloth and the perfectly-balanced Saluc ball are all designed to improve playability... and profitability.